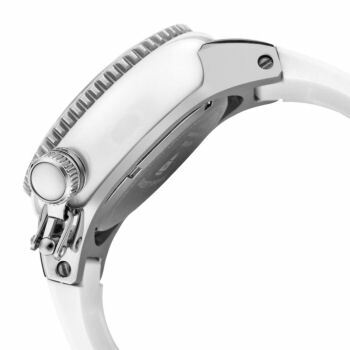 Stainless steel and white ceramic case with a white silicone strap. Uni-directional rotating stainless steel bezel set with 60 diamondsbezel. 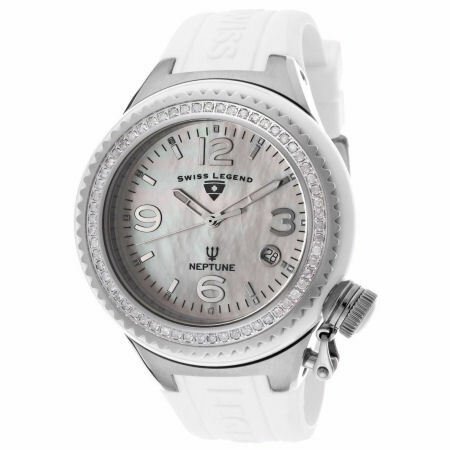 White mother of pearl dial with luminous silver-tone hands and index hour markers. Arabic numerals 3, 6, 9 and 12 o'clock positions. Minute markers around the outer rim. Dial Type: Analog. Luminescent hands and markers. Date display at the 4 o'clock position. Quartz movement. Scratch resistant Sapphitek crystal. Pull / push crown with screw down cap. Screw down case back. Case diameter: 44 mm. Case thickness: 16 mm. Round case shape. Band width: 23 mm. Band length: 8 inches. Tang clasp. Water resistant at 100 meters / 330 feet. Functions: date, hour, minute, second. Additional Info: diamond weight (0.97 ctw). . Swiss Legend Neptune White Ceramic Steel Diamond Unisex Watch 11844D-WWSA.